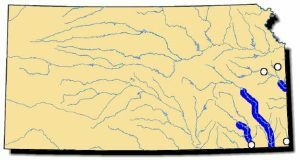 This species ranges in the Mississippi River drainage from western Pennsylvania west to Minnesota, south to eastern Iowa, Kansas, Arkansas, and Oklahoma; in the southeast in the Tombigbee and Alabama River systems. Most populations are stable with some decline in Minnesota and expansion in the Tennessee and Cumberland Rivers. Comments: The butterfly has a dazzling, golden-yellow shell with dark, broken, radiating rays. The overall shape, when viewed at a distance, resembles its namesake. The shells are dimorphic as the male’s shape is flatter than the female. The shell was once valuable in the button industry. Butterfly mussels reportedly are disappearing from many areas where they formerly were found. 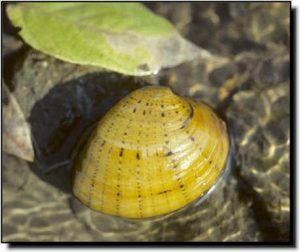 A few still inhabit the best mussel sites of the Fall, Verdigris, Neosho and Marais des Cygnes rivers. The fish hosts for the butterfly represent three different families of native fish.